The iMac's processor has been upgraded and now houses a 7th-gen Kaby Lake 3.4 GHz Intel Core i5 Quad-Core processor that can be overclocked up to 3.8 GHz, as well as 16GB of 2400 MHz DDR4 RAM. Visuals are powered by a dedicated AMD Radeon Pro 570 graphics card with 4GB of vRAM, and for storage, there is a 512GB SSD. Whether your iMac is in your studio, living room, or kitchen, the display is the focal point. With a 5120 x 2880 screen resolution and a 16:9 aspect ratio, you'll be able to playback 5K content natively. The IPS panel allows for wider viewing angles so more people can enjoy the display without having to crowd around it. With a dedicated AMD Radeon Pro 570 graphics card and 4GB of vRAM, the iMac delivers visual effects and 3D graphics, as well as video editing capabilities that can tackle multicam projects in Final Cut Pro X with up to five streams of full-res 4K video, as well as the ability to edit 360° video and create 3D VR content. The iMac houses a 7th-Gen Kaby Lake Intel Core i5 Quad-Core processor that can reach a stock speed of 3.4 GHz. It can also be overclocked up to 3.8 GHz, thanks to Intel Turbo Boost 2.0 technology. The 7th-gen Kaby Lake Intel processor uses low voltage for better energy efficiency while still providing fast performance needed to run processor-intensive applications such as Logic Pro or Final Cut Pro. Combined with 16GB of 2400 MHz DDR4 RAM, the iMac allows you to multitask quickly and efficiently. The current 16GB memory configuration may be upgraded to a maximum of 32GB by using an 8GB chip in each of the four 260-pin SO-DIMM sockets. 27" iMac with Retina 5K Display (Mid 2017) is rated 4.8 out of 5 by 318. Rated 5 out of 5 by troyboy657 from Apple's best iMac yet! I've owned multiple iMac computers over the years, and the mid-2017 iMac with 5K Retina display is simply the best I've ever used. It's updated Retina display is gorgeous; the Intel Kaby Lake CPU is so blazingly fast, it blows my mind how quickly this machine boots up and is ready to go. There's plenty of USB, USB-C, Thunderbolt, and other ports for all your peripherals and accessories, and the new Magic Mouse/Keyboard 2 are a pleasure to use with long-lasting battery life. B&H customer service: you guys are excellent! By far the best customer service experience I've had with any company to date! Would highly recommend this computer to any professional. Rated 5 out of 5 by docrod from First iMac, second Apple product Hi - I have built PC's since the 1980's. I still work on them extensively. I just switched to the iMac after my last home built PC failed. The high quality of the engineering of this machine just floors me. The quality of the display, the fast boot up time, the OS, ... well I'm amazed. My only concerns are that when I had problems with PC's, I could generally fix them on my own, This will not be possible with this machine so I am relying on its durability. The only other thing I would like to see is a back lit keyboard like on their laptops. Nonetheless, I feel I have a very solid computer that will run trouble free for many many years. Rated 5 out of 5 by Thomas from Fantastic! My first iMac but not my first apple product. I have to say that the computer is great. I use it for video editing and photo editing and I couldn’t be happier. One thing I would HIGHLY recommend is that if you were to buy one of these with 8GB of ram, wait for it to turn up and then order more RAM for it. Mine now has 24GB and has made it a lot faster and since the RAM has been upgraded it really opens up the iMac and allows it to breath. Overall I would highly recommend buying one of these if your looking for a long lasted iMac. Just upgrade the RAM to open up the performance possibilities. Rated 5 out of 5 by jeffmc306 from Video editing dream machine! I purchased the June 2017 5K 27 iMac to replace my 2012 15 MacBook Pro for video editing. The MacBook was passed down to a family member which gave me the opportunity to go back to a desktop. I ordered it with the 4.2GHZ processor, 1 TB SSD and 8GB of RAM then added another 32GB myself saving $300. I use it primarily to edit video using Final Cut Pro X including 4K footage from my Lumix GH5. This is a Dream Machine for editing. I no longer have time to grab a coffee before it's done transcoding a video. I use a 6 core Mac Pro with dual graphics cards at work and this new iMac smokes it. On top of that, the 5K display is a big plus for my tired eyes. I considered another MacBook Pro but after adding up the purchase cost, external display & dongles and having a less powerful machine, I am very satisfied with my iMac purchase. Rated 5 out of 5 by Rudy from Great iMac for video and photo editing I upgraded from a MacBook Pro late 2013 model. I upgraded to a SSD and that helped stretch the life of it. However, the laptop showed it’s age whenever I tried any video editing in Final Cut Pro X. Lightroom and Photoshop performance were acceptable. I’m not a pro in the slightest. However, when I buy a Mac I buy more computer than I need since I can’t upgrade anything (besides the RAM). The iMac is awesome and I don’t miss the portability of the laptop. I have an old Cinema Display attached to it too. Having all the real estate to work with is worth loss of portability. It slices through FCP X, LR and PS. It’s a lot of money for this computer but it performs well. This is my third Mac since 2008 and they’ve all been rock solid. Rated 5 out of 5 by Leonard from Great Update The 2017 iMac is a great update to the line. The 2 TByte fusion drive with 128 GByte SSD is especially nice if you don't want to spend the extra dollars on a full SSD. It provides quick program start up and photo editing for enthusiasts-- video editors would probably want to consider the full SSD option. I opted for the 8 GBytes of Apple supplied RAM as aftermarket RAM is about half the price allowing the system to be configured with 40 GBytes total. The specifications on the soon to be released iMac "pro" model are impressive. No doubt the price will be as well. So unless one needs the "pro" level of performance, this model/configuration will provide good value for an amateur photographer. Rated 5 out of 5 by James from Beautiful monitor and great speed I was drawn to the iMac by the beautiful image provided by its 5k monitor. ?It is a replacement for a pc purchased in 2007. ?The iMac provides a startling increase in the speed at which it conducts business. ?I am impressed with how quickly it loads Lightroom CC, which was frustratingly slow on the old pc. ?I must now face up to the task of transferring my photos and the LR catalog to the iMac. ?My only complaint is having the on-off switch and fittings for USB, Thunderbolt, and ethernet connection on the backside of the unit. ?This may make for more pleasing lines on the front of the unit, but promises to be a pain for actual use. Rated 5 out of 5 by Mike P from I couldn't be happier After being a PC guy for over 30 years, I am now a full Mac guy. ?I have had iPhones, iPads, Apple Watch and bought a MacBook a couple years ago; but have always used a Windows machine as my main computer. ?With the great Black Friday deal, I finally decided to get an iMac. ?This is such a wonderful piece of hardware that performs so nicely. ?Everything synchs up so nicely with my iPhone and MacBook, which made the switch even easier. ?I did upgrade memory though a third party reseller, which couldn't have been easier. ?I truly love my iMac and couldn't be happier with it. Yes, Applecare is available for this iMac, by adding the computer to your shopping cart. Will this model be available to be shipped with MacOS High Sierra installed when the new operating system is released later this month? This is dependent on when we received the shipment. Any new shipments after the release of the operating system should include High Sierra. If it does not, you can easily upgrade for free once you start up the computer. I am looking at getting a new 27 iMac for video editing. At the moment I plan to get the 4.2 Ghz, 1TB SSD and I'll buy the one with 8GB Ram and then add an additional 32GB myself. Can someone explain the difference for video editing that the GPU will make? If I order the above specs with AMD Radeon Pro 575 (4GB) then I can order now. Is it worth waiting until AMD Radeon Pro 580 8GB) is in stock or will this not make much of a difference for my needs? It can make a difference depending on the video being worked on. If working on 4k video, the 580 can cut your render time down but, for 1080p video the advantage isn't as great. This iMac description says that it has a 4.2 processor, 8gb RAM and a 1 TB fusion drive. These specs aren't available as an option to buy on Apple's website, which makes me feel like the information is either inaccurate or it's been modified. I want to buy this computer but I don't feel comfortable doing so after seeing that the specifications don't really line up with Apple's?? 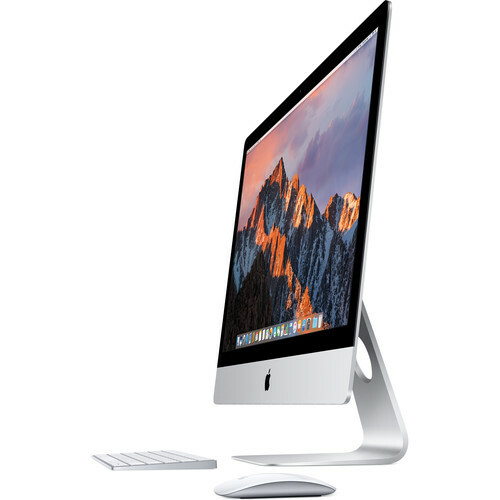 The Apple 27 iMac with Retina 5K Display (Mid 2017) B&amp;H # APIMTQMNEA44 is available from Apple. You can select it by choosing the second configuration on their website and changing the processor to the 4.2 GHz Intel Core i7 Quad-Core instead of the i5. We are an Apple Authorized Reseller so the configurations we have are the same you would be able to order from Apple directly. If you have any other questions about this model, please reach out to us directly via Live chat, Phone or Email at apple@bhphotovideo.com. For questions Regarding when a product is going to be in stock please email our sales department.Sales@bhphoto.com. Can you exchange the Magic Keyboard and Magic Mouse for the Magic Numeric Keyboard and Magic Track Pad and pay just the difference rather than having to purchase the outright and separately? No, I am sorry but we do not offer the option to exchange it. We can however place a special order with the accessories you need, please note special order items may take up to 4 weeks to ship. For more information please contact our sales team directly. Yes, this is brand new and factory sealed. I would like to add additional RAM memory - the memory module mentioned here as an add-on - how easy is it to install and does that void the apple warranty?